We are thrilled to share that we have two new librarians that joined the staff in early January: Matt Schirano and Emily Porter-Fyke. Emily Porter-Fyke, our new Reference & Instruction Librarian, made the move from Massachusetts where she worked at Western New England University as their Information Literacy Librarian. She has a Master's in Library Science from University of North Carolina at Greensboro, and a B.A. in Classics from University of North Carolina at Asheville. Matt Schirano joins us as our Senior Reference Librarian & Instruction Coordinator. His most recent posts included Adjunct Faculty and Librarian at Housatonic Community College and Instruction and Information Literacy Librarian at the University of Bridgeport. He holds a Master's of Library and Information Science from Drexel University, M.S. Educational Technology from Eastern Connecticut State University, B.A. Global Journalism from Drexel University, and B.S. Business Administration from Grand Canyon University. What trend/topic in the library field are you most excited about? MS: Within the United States, foundational concepts like truth and authority are being challenged and rewritten. I find it fascinating if not a little nerve-wracking. EPF: I think I’m most excited about critical librarianship, or “#critlib,” which is a movement for bringing social justice topics and principles into information work. An example of something like that might be a discussion of existing power structures (such as capitalism and the cost of things like internet connections) and how they affect people’s access to information (if you can’t afford internet in today’s world, you’re going to have a much harder time educating yourself). What was your first impressions of campus? EPF: I thought it was a lot prettier than it looked on the website (and it looked really pretty there). I also met the turkeys while walking back to my car after my job interview, which I took as a good sign—and it was! MS: I enjoy the bustle of a mid-semester campus and a library humming with students passionate about their education and focused on success. EPF: Working with students, getting to know the campus, and generally settling in. MS: Ken Kesey is my favorite author. The Foundation trilogy by Isaac Asimov is my favorite series. I know there are more than 3 in the Foundation series, but the first 3 are the best. EPF: Can’t say that I have any one favorite author, but I love Harry Potter and also the Discworld series by Terry Pratchett. EPF: The Last Unicorn by Peter S. Beagle. Can you recommend a good podcast? EPF: “Welcome to Night Vale.” It’s a fiction podcast modeled on community radio. I’ve never actually seen Twin Peaks, but I think you could compare it to Twin Peaks. MS: Tom Petty in the 4th grade. I slept through most of the 2nd set. EPF: I can’t actually remember the first concert I attended (must not have been all that good), but the latest one I went to was Waxahatchee in Boston. Fav. random item in your office/on your desk? MS: A miniature glass puffin, purchased during a vacation to Iceland. It reminds me of adventuring with my wife, which are the moments of my life I cherish the most. EPF: I have a Funko Pop figurine of Regina George from the classic movie Mean Girls, which a friend of mine got for me because I kept joking about how Regina is my favorite character becauae she knows what she wants, she knows hot to get it, and she'll stop at nothing to do so. So that's fun. Can you share the name of a database that you think students should know about? MS: Credo Reference – A great reference source can be the perfect place to gain some momentum during a writing project. EPF: I think Fairfield University History Online would probably be a good one to at least take a look at. It’s cool to know the history of the place you’re getting educated! MS: When the weather is nice my wife and I do a lot of hiking with our dog. I’m an avid reader, 25 books is my Goodreads goal this year! I recently started playing video games after an almost 15 year hiatus. I’ve been enjoying it. EPF: Gaming, mostly. I need to get back into reading more, and I really need to get back into art again (I like creative writing, drawing, and working with polymer clay particularly but I’ve taken lots of art and writing classes over the years). MS: I’m an unapologetic Tolkien fan and re-read the Lord of the Rings trilogy about every 3 years. EPF: I’ve lived a lot of places in this country. You name it, I’ve probably lived there or near there! 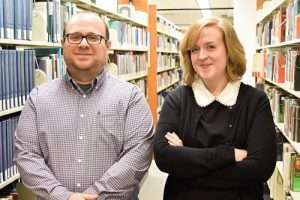 You will often see Emily and Matt at the reference desk, or perhaps in a research class in room 114. If you see them, say hello and welcome them to the University!